Big Pharma is in a rut. The industry keeps spending more and yet making fewer scientific breakthroughs. Last week, GlaxoSmithKline (GSK) announced a radical change in R&D spending. The British drug giant will refocus on data analytics, and the link between the immune system and human disease. It is harbinger of things to come. It is also a big opportunity for investors. GSK is trying to catch bigger trends. By studying the genetic profiles of patients with diseases, scientists are starting to understand what makes humans ill in the first place. Meanwhile, information technology is accelerating at an exponential rate. Every day, researchers use advances in machine learning and artificial intelligence to see patterns in data that were invisible only decade ago. Too often, we believe these advances are limited to self-driving vehicles or automated factories. In reality, this progress applies to a wide variety of sectors. Drug discovery is especially ripe for disruption because it has not evolved in decades. In “The Future Awakens,” a November 2017 research study by the Deloitte Center for Health Solutions, analysts see big changes not even five years from now. They posit that, by 2022, medicine will be predictive, preventive (based on risk), personalized and participatory. 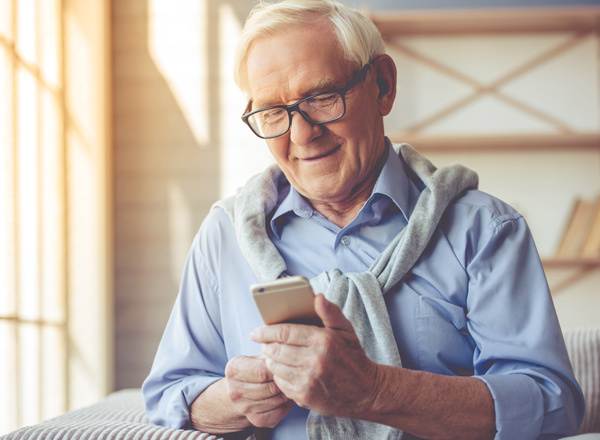 • Computational biologists in hoodies and jeans will build personalized drug treatments based on what they know about the patient’s individual genomic makeup. • And behind the scenes, data scientists will use AI to look for previously unseen biomarkers in algorithmic models. It is a view that dovetails with a recent GSK promotional video. The company is promising to use genetic insights, its growing understanding of the immune system and data analytics at scale. 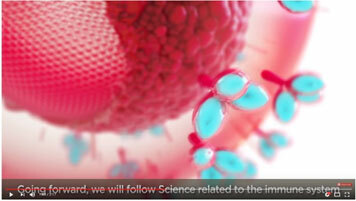 They want to deliver the next generation of scientific breakthroughs and, in some cases, cures. GSK took an important step in that direction with a new $300 million investment in 23andMe, a personal genomics company based in Mountain View, Calif. To date, this Silicon Valley company has collected genomic information for 5 million people — a huge data hoard. Drug discovery is costly and imprecise. A 2013 study, published by Nature Review Drug Discovery, found that only 10% of medicines in development ever reach patients. Using genetics — and coupling it with data analytics to define viability — GSK can drastically reduce the number of programs that go forward. In this case, less is more. Better risk-taking means better profitability. According to Morningstar, on average, shares of major pharmaceutical companies have a return of 16% during the past 12 months. Investors are catching on. 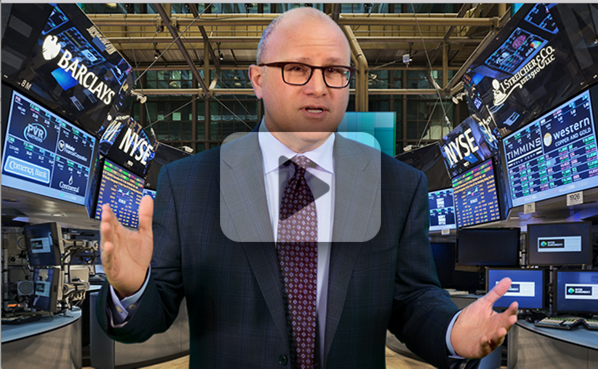 A new era of profitability is on the horizon. However, the best way to play this trend is not big pharma. It is the companies that build the machines and processes to collect genomic information. Illumina Inc. (ILMN) has been one of my favorite stocks for a long time. With 70% market share, the San Diego company makes best-in-class DNA sequencers used by pharmaceutical companies, academic and clinical research organizations. It had sales of $2.75 billion in 2017, up 14.8%. The stock has been a rocket, up 37.8% in 2018, and 71.2% during the last 12 months, pushing the market capitalization to $44.2 billion. Longer-term, this is a great investment. Short term, the trailing price/earnings multiple is a fat, expensive 78. 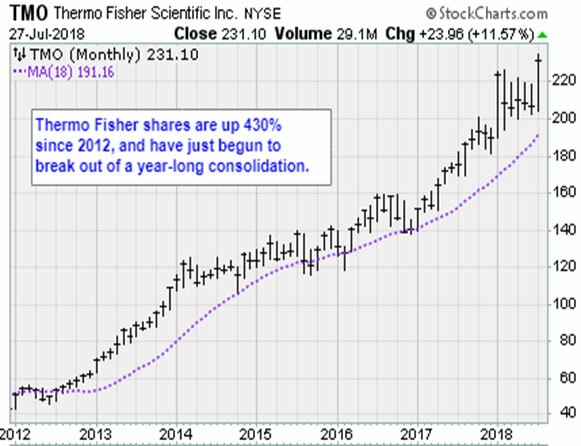 A better near-term play in the sector is Thermo Fisher Scientific Inc. (TMO). The Massachusetts company makes specialty diagnostics. It also makes analytic and image analysis software. These are used by drug companies, government, universities and research laboratories. It is a business that was worth $20.9 billion in 2017, up 14.5% over 2016. Like Illumina, the Thermo gear is considered best-in-class. The company is also strengthening its competitive advantages with an aggressive acquisition policy. In June, the company bought the electron microscope software unit of Roper Technologies (ROP). 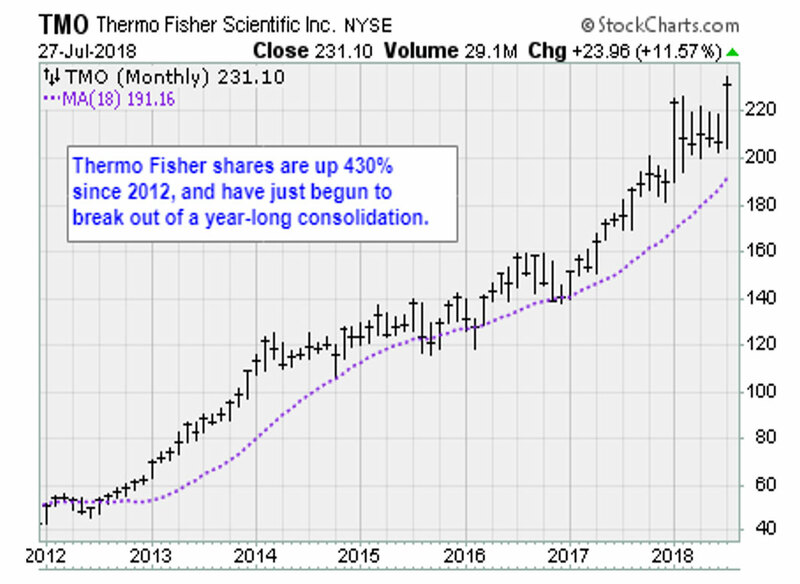 Although Thermo Fisher stock recently broke out to a new high, the company still trades at a reasonable price-to-earnings ratio of 39. Shares are up 21.7% this year, and 31.3% during the past twelve months. The pharmaceutical sector is on the verge of a major change in the way drugs are discovered. The opportunity for investors to get ahead of that transition is exciting. Actually a bigger problem with conventional drug discovery methods, is that very often a single disease is actually a constellation of several diseases, with similar symptoms, altered by genetics and epigenetics. One could literally stumble over a cure for one of the members of that constellation of diseases, find it effective only 22% of the time (because the subgroup of people on whom it worked, actually had Disease Variant A, and the folks who have Disease Variant B, C, D…Q, require different treatments), and the research would abandoned because the drug didn’t work in 78% of the population. When drug discovery was usually done by doctors doing off-label prescribing, this wasn’t much of a difficulty: In the early 1800’s it became known that codeine relieved major depressive disorder for a percentage of the population and didn’t work for others. Abraham Lincoln suffered a refractory form of major depression, that he treated by smoking sweet-hemp, the common name at the time for the cannabis plant. Fairly recent research reveals that the SSRI family of antidepressants cause the body to secrete additional serotonin, which one would expect to cause the depression to worsen. Surprisingly, the SSRI drugs don’t reach their full effect until after the patient has been on them for several months, and it turns out that what happens when the additional serotonin is secreted, is that endogenous dopamine, endogenous morphine, endogenous anandamide (the substance that binds to the cannabinoid receptors), and several other neurochemicals are secreted in larger amounts. Knowing this, there may turn out to be variants of major depressive disorder in which specific neurochemical deficiency occurs because of genetic reasons, and if we can identify the reasons, the deficiencies may be correctable by nutritional supplementation. Old-line pharma companies with good records retention on abandoned drug projects, are likely to produce some surprises, as they re-interpret old research findings in light of new genetic and epigenetic insights. Just as old-line petroleum companies are likely to produce lithium strikes, because they know which kinds of brine are associated with oilfields in which they once drilled.